Jewish-American charities spend $95 million a year on fundraising events. How effective are they in raising money and are they outdated? Part three in a three-part series. How do Jewish charities spend almost $100 million a year on parties? It starts with a sushi spread for a couple hundred people and a full open bar in the Cotillion Room at The Pierre, on Fifth Avenue in Manhattan. Then a waiter in a tux rings a bell, and everyone parades into the grand ballroom where they eat a three-course chicken dinner and ignore the elaborate video presentation. A celebrity guest, perhaps Dr. Ruth or Elie Wiesel, might say a few words. At the end of the night, hundreds of fat programs printed on heavy stock are forgotten on the floor. Some weeks, there’s a Jewish charity gala every evening at The Pierre or the Waldorf-Astoria or The Plaza. That costs a lot of money. The Forward’s ongoing investigation into the financial data of 3,600 Jewish charities has found that groups report spending $95 million a year on fundraising events. That includes $5.6 million spent by UJA-Federation of New York alone, the biggest spender, and $4.9 million spent by the Anti-Defamation League. Sixteen organizations in the Forward’s database spent more than $1 million in a year on fundraising events; 200 groups spend more than $100,000 a year. 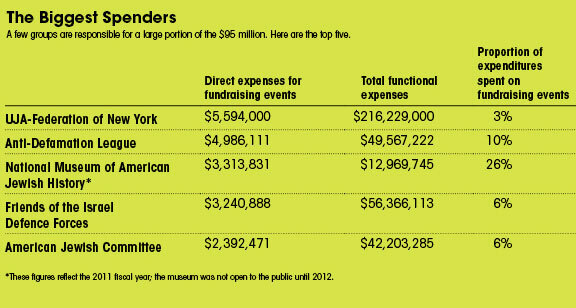 Other top spenders include the National Museum of American Jewish History, which spent $3.3 million; Friends of the Israel Defense Forces, which spent $3.2 million, and the American Jewish Committee, which spent $2.3 million. Of the five groups that spent the most on fundraising events, only UJA-Federation responded to a request for comment. Despite the extravagance, the events bring in real money for some charities. UJA-Federation brings in around $50 million a year on the $5 million it spends on events, according to Mark Medin, the group’s senior vice president. “From our perspective, number one, fundraising galas, fundraising events, are very lucrative ways to raise money,” Medin said. Most groups don’t raise as much as UJA-Federation, though many rely heavily on fundraising at events. Event income alone for all groups taken together comes to $139 million — and that doesn’t include donations made through the events. Still, the $95 million represents a huge outlay of charitable dollars. The 15 groups that spend the most on fundraising events in a year paid $34 million altogether — more than the combined total expenses of the 1,025 smallest Jewish groups. For some groups, those expenditures amount to only a tiny fraction of the total dollars they spend in a year. The $5.6 million that UJA spends on fundraising amounts to just 2.6% of its annual expenditures. But for other groups, the dent is much larger. The ADL’s $4.9 million on fundraising events in 2011 was 10% of its total expenditures. And a group called American Friends of Rabin Medical Center spent $300,000 on fundraising events in 2011, 28% of its total expenditures. Despite the costs of the galas, the people who put them on defend them as fundraising tools and as ways to connect with donors. If Jewish galas feel old-fashioned, there’s a reason: Jewish charities have been holding them for more than a century. The first modern Jewish fundraising gala may have been a banquet held in 1849 in New York City, according to Jonathan Sarna, a professor of Jewish studies at Brandeis University. The Hebrew Benevolent Society, a Jewish umbrella fundraising group, held the gala with a related group called the German Hebrew Benevolent Society. Daniel Webster, the famous antebellum Massachusetts senator, sent a letter regretting his absence. Galas thrive on a competitive approach to philanthropy, encouraged by charities and their backers. Until 15 years ago, it was standard practice at Jewish galas for hosts to call out individual attendees by name in front of the entire ballroom and ask how much they would pledge. This practice is now considered gauche, but modified versions are still common. At a Friends of the IDF event in March 2013, names weren’t called, but attractive women carried microphones to attendees who volunteered to stand up and announce their gifts. Today, galas continue to give the wealthiest members of the community other, subtler ways to exhibit their wealth. Bigger gifts buy bigger advertisements in gala programs. And the wealthiest donors win the biggest items at the charity auctions that sometimes accompany the galas. Jewish galas haven’t survived a century and a half just because they let the rich show off. Charity officials continue to believe that these galas bring in donations that wouldn’t come otherwise. Some people just like going to parties, according to Medin. But much of the $50 million that UJA raises each year comes from attendees looking to show respect to, and make connections with, the people that the galas honor. In December 2013, a UJA gala for Goldman Sachs chairman and CEO Lloyd Blankfein raised $26 million from donors looking to honor the Wall Street king. “If you didn’t have the event, they wouldn’t be making the gift,” Medin said. There are other, less apparent social functions, too. Galas can be fun, as the photos in the New York Times’ society page try to show each week. And they give the charities an opportunity to explain their work to donors. At JUF, programs at galas focus increasingly on describing the federation’s work. “We spend a lot of time thinking about what we want to happen in that room and what we want to expose our donors to,” Sternberg said. Sanderson’s federation still spent $1.1 million on fundraising events in its 2011 fiscal year — 2% of its total expenditures. But Sanderson said that his group thinks of its galas as “thank you” parties for big donors, not as a place to make a fundraising “ask.” His federation has pushed alternative events, like a fundraising bike ride. At the New York and Chicago federations, there’s no sense that extravagant galas are in decline. What’s been most remarkable about galas is their universal appeal. “The gala dinner seems to be one of the few things that transcend denomination and organization: Every American Jewish institution — synagogues, landsmanshaften day schools, benevolent and charitable societies — made a point of mounting one,” said Jenna Weissman Joselit, professor of history at the George Washington University and monthly columnist for the Forward. Carmel Chiswick, a professor of economics at the George Washington University, noted that galas were most popular in the 1950s and ’60s, and not only among Jews. As large umbrella organizations like federations decline, along with people’s connections to them, big galas may fade away, Chiswick said.